OVERLAND PARK, Kan., July 25, 2018 /PRNewswire/ -- QTS Realty Trust, Inc. ("QTS" or the "Company") (NYSE: QTS) today announced operating results for the second quarter ended June 30, 2018. In conjunction with its strategic growth plan announced in the prior quarter, QTS is realigning its product offerings around Hyperscale and Hybrid Colocation, while exiting certain of its C3-Cloud and Managed Services offerings, as well as colocation revenue attached to certain customers in the Cloud and Managed Services business that we expect will not remain with QTS post transition (collectively "Non-Core" operations). QTS has realigned information included in this release to focus its guidance and key performance metrics around its Core business, which primarily consists of its Hyperscale and Hybrid Colocation businesses, along with technology and services from its Cloud and Managed Services business that support Hyperscale and Hybrid Colocation customers, which together will be the Company's primary business following the completion of the strategic growth plan. For informational purposes, QTS has excluded its estimated Non-Core business from certain financial and operating statistics below. Reported consolidated net loss of $6.4 million for the quarter ended June 30, 2018, a decrease compared to net income of $4.6 million for the same period of 2017, primarily a result of $11.4 million of one-time Non-Core restructuring expenses incurred for the quarter ended June 30, 2018 associated with the Company's strategic growth plan. Net loss per basic and diluted share for the second quarter of 2018 was $0.16, compared to net income per basic and diluted share of $0.08 for the second quarter of 2017. Reported consolidated FFO available to common shareholders and OP unit holders of $25.2 million for the quarter ended June 30, 2018, a decrease of 27.9% compared to FFO of $34.9 million for the same period in 2017. FFO for the quarter ended June 30, 2018 on a fully diluted per share basis was $0.43 per share, a decrease of 31.1% compared to FFO per fully diluted share of $0.63 for the same period of 2017. Reported Core Operating FFO available to common shareholders and OP unit holders of $36.9 million for the quarter ended June 30, 2018, compared to Core Operating FFO of $30.6 million for the quarter ended June 30, 2017. Core Operating FFO for the quarter ended June 30, 2018 on a fully diluted per share basis was $0.64 per share, an increase of 15.2% compared to Core Operating FFO per fully diluted share in the same period of 2017. Reported Core Adjusted EBITDA of $53.6 million for the quarter ended June 30, 2018, an increase of 27.9% compared to the same period in 2017. Reported Core NOI of $67.6 million for the quarter ended June 30, 2018, an increase of 20.3% compared to the same period in 2017. Recognized total Core revenues of $102.5 million for the quarter ended June 30, 2018, an increase of 15.6% compared to the same period in 2017. Signed new and modified renewal Core leases aggregating to $13.1 million of Core incremental annualized rent, net of downgrades, during the second quarter of 2018. "QTS' strong financial and operating performance during the second quarter reflects continued execution on our strategic growth plan," said Chad Williams, Chairman and CEO – QTS. "Customer activity, healthy pricing dynamics and low churn, combined with the enhanced visibility provided by our significant backlog, supports strong momentum for the remainder of 2018 and 2019." Net loss recognized in the second quarter of 2018 was $6.4 million ($0.16 per basic and diluted share), compared to net income of $4.6 million ($0.08 per basic and diluted share) recognized in the second quarter of 2017. The Company incurred $11.4 million of restructuring expenses in the second quarter of 2018 associated with its exit of certain of its C3-Cloud and Managed Services offerings, of which $4.8 million related to employee severance expenses, $3.4 million related to professional fees, $3.1 million related to the sale or write-off of certain product related assets and $0.1 million related to other miscellaneous restructuring expenses. The Company also incurred $0.7 million of transaction, integration and impairment costs in the second quarter of 2018, compared to transaction, integration, and impairment costs of $0.2 million in the second quarter of 2017. During the second quarter of 2018, the Company recognized $0.1 million of income tax expense compared to $1.4 million of income tax benefit recognized in the second quarter of 2017. QTS generated total consolidated revenues of $112.3 million in the second quarter of 2018, an increase of 4.1% compared to $107.9 million in the second quarter of 2017. Consolidated MRR as of June 30, 2018 was $31.2 million compared to consolidated MRR as of June 30, 2017 of $31.7 million. QTS generated total Core revenues of $102.5 million in the second quarter of 2018, an increase of 15.6% compared to $88.7 million in the second quarter of 2017. Core MRR as of June 30, 2018 was $29.5 million compared to Core MRR as of June 30, 2017 of $26.1 million. 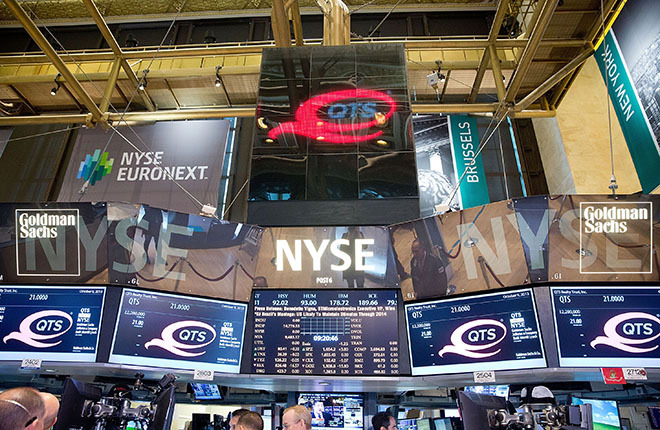 QTS generated Core Operating FFO of $36.9 million in the second quarter of 2018 (which includes tax expense of approximately $0.2 million) an increase of approximately 20.7% compared to Core Operating FFO of $30.6 million in the second quarter of 2017 (which included a non-cash tax benefit of approximately $1.4 million). Core Operating FFO per fully diluted share was $0.64 in the second quarter of 2018, an increase of 15.2% compared to Core Operating FFO per fully diluted share of $0.55 in the second quarter of 2017. Excluding the effects of the Company's non-cash deferred tax benefit/(expense), Core Operating FFO was $0.64 per fully diluted share in the second quarter of 2018, an increase of 20.8% compared to $0.53 per fully diluted share in the second quarter of 2017. Additionally, QTS generated $53.6 million of Core Adjusted EBITDA in the second quarter of 2018, an increase of 27.9% compared to $41.9 million for the second quarter of 2017. During the quarter ended June 30, 2018, QTS entered into new and modified Core leases aggregating to $31.3 million of annualized rent which includes revenue from new leases plus revenue from modified renewals. Removing non-incremental annualized MRR from modified renewals and deducting downgrades during the period resulted in $13.1 million in Core incremental annualized rent for the quarter ended June 30, 2018. The Company's second quarter leasing performance was driven by strong volume in its hybrid colocation product, which contributed the majority of the quarter's incremental annualized rent. Pricing on new and modified leases signed during the second quarter was higher than the prior four quarter average, primarily driven by a higher proportion of smaller footprint hybrid colocation deals. During the quarter ended June 30, 2018, QTS renewed Core leases with total annualized rent of $22.3 million at an average rent per square foot of $219, which was 5.6% higher than the annualized Core rent prior to their respective renewals. There is variability in the Company's renewal rates based on the mix of product types renewed, and renewal rates are generally expected to increase in the low to mid-single digits as compared to pre-renewal pricing. Core Rental Churn (which the Company defines as Core MRR lost in the period to a customer intending to fully exit the QTS platform in the near term compared to total Core MRR at the beginning of the period) was 0.8% for the second quarter of 2018. Consolidated Rental Churn was 1.8% for the second quarter of 2018. During the quarter ended June 30, 2018, QTS commenced Core customer leases (which includes new Core customers and also existing Core customers that renewed their lease term) representing approximately $28.6 million of annualized rent at $593 per square foot. Average pricing on Core commenced leases during the second quarter of 2018 increased compared to the prior four quarter average primarily due to a higher proportion of smaller footprint hybrid colocation deals. As of June 30, 2018, the Core booked-not-billed MRR balance (which represents Core customer leases that have been executed, but for which lease payments have not commenced as of June 30, 2018) was approximately $4.3 million, or $51.3 million of annualized Core rent, and compares to $4.5 million, or $53.9 million of annualized Core rent at March 31, 2018. The Core booked-not-billed balance is expected to contribute an incremental $5.5 million to revenue in 2018 (representing $16.9 million in annualized Core revenues), an incremental $14.9 million in 2019 (representing $19.9 million in annualized Core revenues), and an incremental $14.5 million in annualized Core revenues thereafter. During the quarter ended June 30, 2018 the Company brought online approximately four megawatts of gross power and approximately 14,000 net rentable square feet ("NRSF") of raised floor and customer specific capital at its Ashburn facility at an aggregate cost of approximately $71 million, which includes $17 million related to the underlying land. In addition, during the second quarter of 2018, the Company's significant development activity continued at the Irving, Ashburn, Atlanta-Metro, Chicago, Piscataway and Fort Worth facilities to have space ready for customers in 2018 and forward. The Company expects to bring an additional 67,000 raised floor NRSF into service in 2018 at an aggregate cost of approximately $132 million. In June 2018, QTS issued 3,162,500 shares of 6.50% Series B Cumulative Convertible Perpetual Preferred Stock ("Series B Preferred Stock") with a liquidation preference of $100.00 per share, which included 412,500 shares the underwriters agreed to purchase pursuant to the exercise of their overallotment option in full. The Company used the net proceeds of approximately $304 million to repay amounts outstanding under its unsecured revolving credit facility. As of June 30, 2018, the Company's total debt balance net of cash and cash equivalents was less than $1.1 billion, resulting in a net debt to annualized Consolidated Adjusted EBITDA of 4.7x. This ratio compares to the 5.7x net debt to annualized Adjusted EBITDA reported in the first quarter of 2018, with the reduction primarily a result of proceeds from the Series B Preferred Stock offering used to pay down amounts outstanding under the unsecured revolving credit facility. As of June 30, 2018, the Company had total available liquidity of approximately $868 million which was comprised of $816 million of available capacity under the Company's unsecured revolving credit facility and approximately $52 million of cash and cash equivalents. References to QTS' "Core" business refers to the Company's business expected to be retained following the completion of the previously announced strategic growth plan, as described above. The Company is reaffirming its 2018 guidance, as outlined below. Guidance for the year ended December 31, 2018 excludes results from the Non-Core business unit. Reflects cash capital expenditures and excludes expenditures from acquisitions. The Company is adjusting its previously announced rental churn guidance of 3% to 6%, and now expects annual rental churn for the Core business of 3% to 5%. QTS does not provide reconciliations for the non-GAAP financial measures included in its guidance provided above due to the inherent difficulty in forecasting and quantifying certain amounts that are necessary for such reconciliations, including net income (loss) and adjustments that could be made for restructuring costs, transaction costs, lease exit costs, asset impairments and loss on disposals and other charges as those amounts are subject to significant variability based on future transactions that are not yet known, the amount of which, based on historical experience, could be significant. This release includes certain non-GAAP financial measures that management believes are helpful in understanding the Company's business, as further described below. The Company does not, nor does it suggest investors should, consider such non-GAAP financial measures in isolation from, or as a substitute for, GAAP financial information. The Company believes that the presentation of non-GAAP financial measures provide meaningful supplemental information to both management and investors that is indicative of the Company's operations. The Company has included a reconciliation of this additional information to the most comparable GAAP measure in the selected financial information below. The Company will host a conference call and webcast on July 26, 2018, at 8:30 a.m. Eastern time (7:30 a.m. Central time) to discuss its financial results, current business trends and market conditions. The dial-in number for the conference call is (877) 883-0383 (U.S.) or (412) 902-6506 (International). The participant entry number is 5615621# and callers are asked to dial in ten minutes prior to start time. A link to the live broadcast and the replay will be available on the Company's website (www.qtsdatacenters.com) under the Investors tab. 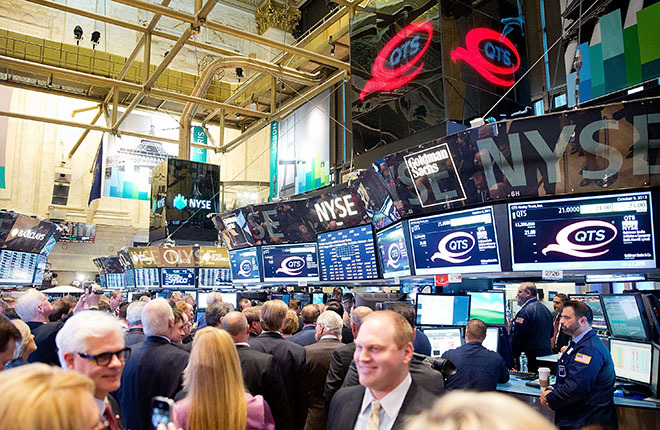 QTS Realty Trust, Inc. (NYSE: QTS) is a leading provider of secure, compliant data center solutions, hybrid cloud and fully managed services. QTS' integrated technology service platform of hyperscale and hybrid colocation provides flexible, scalable, secure IT solutions for web and IT applications. QTS' Critical Facilities Management (CFM) provides increased efficiency and greater performance for third-party data center owners and operators. QTS owns, operates or manages 26 data centers and supports more than 1,000 Core customers primarily in North America. Some of the statements contained in this release constitute forward-looking statements within the meaning of the federal securities laws. Forward-looking statements relate to expectations, beliefs, projections, future plans and strategies, anticipated events or trends and similar expressions concerning matters that are not historical facts. In particular, statements pertaining to the Company's capital resources, portfolio performance, results of operations, anticipated growth in our funds from operations and anticipated market conditions contain forward-looking statements. In some cases, you can identify forward-looking statements by the use of forward-looking terminology such as "may," "will," "should," "expects," "intends," "plans," "anticipates," "believes," "estimates," "predicts," or "potential" or the negative of these words and phrases or similar words or phrases which are predictions of or indicate future events or trends and which do not relate solely to historical matters. You also can identify forward-looking statements by discussions of strategy, plans or intentions. The forward-looking statements contained in this release reflect the Company's current views about future events and are subject to numerous known and unknown risks, uncertainties, assumptions and changes in circumstances that may cause actual results to differ significantly from those expressed in any forward-looking statement. The Company does not guarantee that the transactions and events described will happen as described (or that they will happen at all). The following factors, among others, could cause actual results and future events to differ materially from those set forth or contemplated in the forward-looking statements: adverse economic or real estate developments in the Company's markets or the technology industry; obsolescence or reduction in marketability of our infrastructure due to changing industry demands; global, national and local economic conditions; the Company's ability to successfully execute its strategic growth plan and realize its expected benefits; risks related to the Company's international operations; difficulties in identifying properties to acquire and completing acquisitions; the Company's failure to successfully develop, redevelop and operate acquired properties or lines of business; significant increases in construction and development costs; the increasingly competitive environment in which the Company operates; defaults on, or termination or non-renewal of leases by customers; decreased rental rates or increased vacancy rates; increased interest rates and operating costs, including increased energy costs; financing risks, including the Company's failure to obtain necessary outside financing; dependence on third parties to provide Internet, telecommunications and network connectivity to the Company's data centers; the Company's failure to qualify and maintain its qualification as a real estate investment trust; environmental uncertainties and risks related to natural disasters; financial market fluctuations; and changes in real estate and zoning laws, revaluations for tax purposes and increases in real property tax rates. While forward-looking statements reflect the Company's good faith beliefs, they are not guarantees of future performance. Any forward-looking statement speaks only as of the date on which it was made. The Company disclaims any obligation to publicly update or revise any forward-looking statement to reflect changes in underlying assumptions or factors, of new information, data or methods, future events or other changes. For a further discussion of these and other factors that could cause the Company's future results to differ materially from any forward-looking statements, see the section entitled "Risk Factors" in the Company's Annual Report on Form 10-K for the year ended December 31, 2017 and other periodic reports the Company files with the Securities and Exchange Commission. The balance sheet at June 30, 2018 and December 31, 2017, has been derived from the consolidated financial statements at that date, but does not include all of the information and footnotes required by United States generally accepted accounting principles for complete financial statements. As of June 30, 2018, construction in progress included $113.0 million related to land acquisitions whereby the initiation of development activities has begun to prepare the property for its intended use. As of June 30, 2018 and December 31, 2017, deferred costs, net included $6.9 million and $7.9 million of deferred financing costs net of amortization, respectively, and $37.8 million and $33.7 million of deferred leasing costs net of amortization, respectively. Debt issuance costs, net related to the Senior Notes and term loan portion of the Company's unsecured credit facility aggregating $10.8 million and $11.6 million at June 30, 2018 and December 31, 2017, respectively, have been netted against the related debt liability line items for both periods presented. As of June 30, 2018 and December 31, 2017, other assets, net included $49.3 million and $57.4 million of corporate fixed assets, respectively, primarily relating to construction of corporate offices, leasehold improvements and product related assets. As of June 30, 2018, the total liquidation preference of the Series A Preferred Stock was $107.0 million, calculated as $25.00 liquidation preference per share times 4,280,000 shares outstanding. As of June 30, 2018, the total liquidation preference of the Series B Preferred Stock was $316.3 million, calculated as $100.00 liquidation preference per share times 3,162,500 shares outstanding. Net income (loss) attributable to QTS Realty Trust, Inc.
Other revenue – Includes straight line rent, sales of scrap metals and other unused materials and various other revenue items. Straight line rent was $1.4 million, $2.7 million and $0.9 million for the three months ended June 30, 2018, March 31, 2018 and June 30, 2017, respectively. Straight line rent was $4.1 million and $2.4 million for the six months ended June 30, 2018 and 2017, respectively. General and administrative expenses – Includes personnel costs, sales and marketing costs, professional fees, travel costs, product investment costs and other corporate general and administrative expenses. General and administrative expenses were 18.7%, 19.6%, and 20.9% of total revenues for the three months ended June 30, 2018, March 31, 2018 and June 30, 2017, respectively. General and administrative expenses were 19.1% and 20.9% of total revenues for the six months ended June 30, 2018 and 2017, respectively. Restructuring Costs – The Company incurred $11.4 million of restructuring expenses for the three months ended June 30, 2018 associated with its strategic growth plan, of which $4.8 million related to employee severance expenses, $3.4 million related to professional fees, $3.1 million related to the sale or write-off of certain product related assets, and $0.1 million related to other miscellaneous restructuring expenses. The Company incurred $20.0 million of restructuring expenses for the six months ended June 30, 2018 associated with its strategic growth plan, of which $8.5 million related to employee severance expenses, $7.1 million related to the write-off of certain product related assets, $3.9 million related to professional fees and $0.5 million related to other miscellaneous restructuring expenses. Tax benefit (expense) of taxable REIT subsidiaries – The Company's non-cash deferred tax benefit, in both the current year and the prior year, relate to recorded operating losses which include certain restructuring, transaction and integration costs. Noncontrolling interest – The noncontrolling ownership interest of QualityTech, LP was 11.5% and 12.2% as of June 30, 2018 and 2017, respectively. Basic and diluted net income (loss) per share were calculated using the two-class method. Comprehensive income (loss) attributable to QTS Realty Trust, Inc. The Company considers funds from operations ("FFO"), to be a supplemental measure of its performance which should be considered along with, but not as an alternative to, net income (loss) and cash provided by operating activities as a measure of operating performance. The Company calculates FFO in accordance with the standards established by the National Association of Real Estate Investment Trusts ("NAREIT"). FFO represents net income (loss) (computed in accordance with GAAP), adjusted to exclude gains (or losses) from sales of property, real estate-related depreciation and amortization and similar adjustments for unconsolidated partnerships and joint ventures. The Company's management uses FFO as a supplemental performance measure because, in excluding real estate-related depreciation and amortization and gains and losses from property dispositions, it provides a performance measure that, when compared year over year, captures trends in occupancy rates, rental rates and operating costs. Due to the volatility and nature of certain significant charges and gains recorded in the Company's operating results that management believes are not reflective of its core operating performance, management computes an adjusted measure of FFO, which the Company refers to as Operating FFO. The Company generally calculates Operating FFO as FFO excluding certain non-routine charges and gains and losses that management believes are not indicative of the results of the Company's operating real estate portfolio. The Company believes that Operating FFO provides investors with another financial measure that may facilitate comparisons of operating performance between periods and, to the extent other REITs calculate Operating FFO on a comparable basis, between REITs. Operating FFO and Adjusted Operating Funds From Operations ("Adjusted Operating FFO") are non-GAAP measures that are used as supplemental operating measures and to provide additional information to users of the financial statements. The Company calculates Adjusted Operating FFO by adding or subtracting from Operating FFO items such as: maintenance capital investment, paid leasing commissions, amortization of deferred financing costs and bond discount, non-real estate depreciation, straight line rent adjustments, deferred taxes and non-cash compensation. The Company offers these measures because it recognizes that FFO, Operating FFO and Adjusted Operating FFO will be used by investors as a basis to compare its operating performance with that of other REITs. However, because FFO, Operating FFO and Adjusted Operating FFO exclude real estate depreciation and amortization and capture neither the changes in the value of the Company's properties that result from use or market conditions, nor the level of capital expenditures and capitalized leasing commissions necessary to maintain the operating performance of its properties, all of which have real economic effect and could materially impact its financial condition, cash flows and results of operations, the utility of FFO, Operating FFO and Adjusted Operating FFO as measures of its operating performance is limited. The Company's calculation of FFO may not be comparable to measures calculated by other companies who do not use the NAREIT definition of FFO or do not calculate FFO in accordance with NAREIT guidance. In addition, the Company's calculations of FFO, Operating FFO and Adjusted Operating FFO are not necessarily comparable to FFO, Operating FFO and Adjusted Operating FFO as calculated by other REITs that do not use the same definition or implementation guidelines or interpret the standards differently from us. FFO, Operating FFO and Adjusted Operating FFO are non-GAAP measures and should not be considered a measure of the Company's results of operations or liquidity or as a substitute for, or an alternative to, net income (loss), cash provided by operating activities or any other performance measure determined in accordance with GAAP, nor is it indicative of funds available to fund its cash needs, including its ability to make distributions to its stockholders. Core Operating FFO and Adjusted Core Operating FFO represent Operating FFO and Adjusted Operating FFO of the Company's Core business, respectively, and are used as supplemental performance measures because they reflect results of the portion of the business the Company expects to retain following completion of the strategic growth plan. The Company's calculations of Operating FFO and Adjusted Operating FFO may not be comparable to Operating FFO and Adjusted Operating FFO as calculated by other REITs that do not use the same definition. The Company considers earnings before interest, taxes, depreciation and amortization for real estate ("EBITDAre"), to be a supplemental measure of its performance which should be considered along with, but not as an alternative to, net income (loss) and cash provided by operating activities as a measure of operating performance. The Company calculates EBITDAre in accordance with the standards established by the National Association of Real Estate Investment Trusts ("NAREIT"). EBITDAre represents net income (loss) (computed in accordance with GAAP), adjusted to exclude gains (or losses) from sales of depreciated property, income tax expense (or benefit), interest expense, depreciation and amortization, impairments of depreciated property and unconsolidated partnerships and joint ventures, and similar adjustments for unconsolidated partnerships and joint ventures. The Company's management uses EBITDAre as a supplemental performance measure because it provides a performance measure that, when compared year over year, captures the performance of the Company's operations by removing the impact of capital structure (primarily interest expense) and asset base charges (primarily depreciation and amortization) from its operating results. Due to the volatility and nature of certain significant charges and gains recorded in the Company's operating results that management believes are not reflective of its operating performance, management computes an adjusted measure of EBITDAre, which the Company refers to as Adjusted EBITDA. The Company generally calculates Adjusted EBITDA excluding certain non-routine charges, write off of unamortized deferred financing costs, gains (losses) on extinguishment of debt, and transaction and integration costs, in addition to non-cash recurring costs such as equity-based compensation. The Company believes that Adjusted EBITDA provides investors with another financial measure that may facilitate comparisons of operating performance between periods and, to the extent other REITs calculate Adjusted EBITDA on a comparable basis, between REITs. Management uses EBITDAre and Adjusted EBITDA as supplemental performance measures as they provide useful measures of assessing the Company's operating results. Other companies may not calculate EBITDAre or Adjusted EBITDA in the same manner. Accordingly, the Company's EBITDAre and Adjusted EBITDA may not be comparable to others. EBITDAre and Adjusted EBITDA should be considered only as supplements to net income (loss) as measures of the Company's performance and should not be used as substitutes for net income (loss), as measures of its results of operations or liquidity or as an indications of funds available to meet its cash needs, including its ability to make distributions to its stockholders. The Company calculates net operating income ("NOI") as net income (loss) (computed in accordance with GAAP), excluding: interest expense, interest income, tax expense (benefit) of taxable REIT subsidiaries, depreciation and amortization, write off of unamortized deferred financing costs, gain (loss) on extinguishment of debt, transaction and integration costs, gain (loss) on sale of real estate, restructuring costs and general and administrative expenses. Management uses NOI as a supplemental performance measure because it provides a useful measure of the operating results from its customer leases. In addition, management believes it is useful to investors in evaluating and comparing the operating performance of its properties and to compute the fair value of its properties. The Company's NOI may not be comparable to other REITs' NOI as other REITs may not calculate NOI in the same manner. NOI should be considered only as a supplement to net income (loss) as a measure of the Company's performance and should not be used as a measure of results of operations or liquidity or as an indication of funds available to meet cash needs, including the ability to make distributions to stockholders. NOI is a measure of the operating performance of the Company's properties and not of the Company's performance as a whole. Core NOI represents NOI of the Company's Core business and is used as a supplemental performance measure because it reflects results of the portion of the business the Company expects to retain following completion of the strategic growth plan. NOI and Core NOI are therefore not substitutes for net income (loss) as computed in accordance with GAAP. Includes facility level G&A expense allocation charges of 4% of cash revenue for all facilities, with the exception of the leased facilities acquired in 2015, which include G&A expense allocation charges of 10% of cash revenue. These allocated charges, with respect to Core operations, aggregated to $4.6 million, $4.2 million and $3.8 million for the three months ended June 30, 2018, March 31, 2018 and June 30, 2017, respectively. Includes facility level G&A expense allocation charges of 4% of cash revenue for all facilities, with the exception of the leased facilities acquired in 2015, which include G&A expense allocation charges of 10% of cash revenue. These allocated charges, with respect to Core operations, aggregated to $8.8 million and $7.6 million for the six months ended June 30, 2018 and 2017, respectively. The Company calculates MRR as monthly contractual revenue under signed leases as of a particular date, which includes revenue from its rental and cloud and managed services activities, but excludes customer recoveries, deferred set-up fees, variable related revenues, non-cash revenues and other one-time revenues. MRR does not include the impact from booked-not-billed leases as of a particular date, unless otherwise specifically noted. Separately, the Company calculates recognized MRR as the recurring revenue recognized during a given period, which includes revenue from its rental and cloud and managed services activities, but excludes customer recoveries, deferred set up fees, variable related revenues, non-cash revenues and other one-time revenues. Management uses MRR, recognized MRR and Core MRR as supplemental performance measures because they provide useful measures of increases in contractual revenue from the Company's customer leases and customer leases attributable to the Company's Core business. MRR, recognized MRR and Core MRR should not be viewed by investors as alternatives to actual monthly revenue, as determined in accordance with GAAP. Other companies may not calculate MRR, recognized MRR or Core MRR in the same manner. Accordingly, the Company's MRR, recognized MRR and Core MRR may not be comparable to other companies' MRR, recognized MRR and Core MRR. MRR, recognized MRR and Core MRR should be considered only as supplements to total revenues as a measure of its performance. MRR, recognized MRR and Core MRR should not be used as measures of the Company's results of operations or liquidity, nor is it indicative of funds available to meet its cash needs, including its ability to make distributions to its stockholders. In conjunction with its strategic growth plan announced in the prior quarter, QTS is realigning its product offerings around Hyperscale and Hybrid Colocation, while exiting certain of its C3-Cloud and Managed Services offerings, as well as colocation revenue attached to certain customers in the Cloud and Managed Services business that we expect will not remain with QTS post transition (collectively "Non-Core" operations). 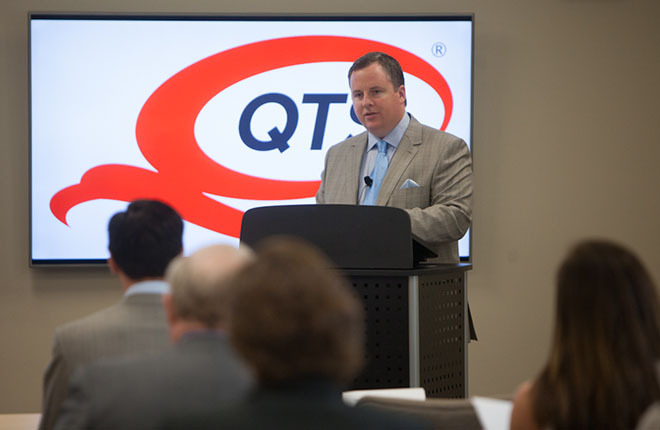 QTS has realigned information included in this release to focus its guidance and key performance metrics around its Core business, which primarily consists of its Hyperscale and Hybrid Colocation businesses, along with technology and services from its Cloud and Managed Services business that support Hyperscale and Hybrid Colocation customers, which together will be the Company's primary business following the completion of the strategic growth plan. The table below includes certain non-GAAP financial measures, separated on a Core / Non-Core basis, which management believes is helpful to understanding the financial results of the Company's Core business. In order to bifurcate revenues and costs the Company utilized the following methodology: For managed service revenue, QTS identified the specific products that it expects to divest of in 2018, and allocated their specific revenue to Non-Core operations. For customers that had Non-Core managed service revenue and also had colocation revenue, the Company performed an analysis on a customer-by-customer basis to determine the portion of colocation revenue considered to be Non-Core. For operating costs, the Company identified costs such as rent expense, software licenses, communications expenses and repairs and maintenance costs associated with servicing the aforementioned Non-Core revenue and classified those costs as Non-Core. For general and administrative costs, certain personnel costs, including severance benefits and equity-based compensation, that were associated with personnel impacted by the strategic growth plan have been reclassified in the first quarter of 2018 to restructuring costs. For current and prior periods Non-Core personnel costs associated with wages and salaries were not reclassified to restructuring cost but are shown in their respective line items as Non-Core. QTS identified the software costs, communications expense and other similar general and administrative costs that are utilized to support the aforementioned revenue and reclassified those costs to Non-Core accordingly. For depreciation costs, the Company identified the equipment that services the impacted customers, which QTS expects to dispose of in the transaction, and reclassified the associated depreciation costs to Non-Core. Write-offs of capitalized equipment or other capitalized costs that QTS has abandoned have been reclassified to restructuring costs. Consists of property operating costs as well as real estate taxes and insurance.